Americans are eating more soybean products than ever before. Soy is showing up everywhere - in fortified juices, imitation meats, dairy-free cheeses, yogurts, and frozen desserts; nutrition bars, cereals; and more. It makes sense. After all, soy is the only complete food in the botanical kingdom. Soy contains 42 percent protein, more than any other plant.36 It's high in fiber. It's a natural source of good-for-you omega-3 fatty acids. It's a powerhouse of protective antioxidants and phyto-nutrients (beneficial compounds found in plants). It provides a wealth of vitamins, including vitamins A (as beta-17 carotene), B1, B2, B12, C, D, E, and K - and several essential minerals, such as selenium and zinc. In order to reap the nutritional benefits of soy, it must be cultured. Culturing simply means adding beneficial microbial cultures to a food and letting them transform it into something more nutritious and digestible. Yogurt, sour cream, kefir, and pickles are all examples of cultured foods. If you take a trip to China, Japan, Indonesia, or Singapore, you'll find that the traditional Asian diet does not include large quantities of super-processed, genetically modified soy products like we have in Western countries today (such as isolated soy protein, a common ingredient found in nutrition bars). It incorporates small amounts of natural, cultured whole soy foods, such as natto (cultured soybeans), miso (a condiment made from cultured soybean paste), shoyu (soy sauce or tamari), and tempeh (a compact cultured soybean cake). Soy wasn't even considered edible until fermentation techniques were developed during the Chou Dynasty. What the producers of modern, uncultured soy foods won't tell you is that in addition to all the nutrients it contains, soy also contains anti-nutrients. These anti-nutrients prevent your body from absorbing essential minerals and trace elements. Unfortunately, cooking will not destroy these anti-nutrients. Only the culturing process will. According to two newly published research papers, tests in samples of human blood showed that when soy is cultured, its potential to produce an allergic reaction is reduced by as much as 99 percent. The most important benefit of culturing, though, is that the process is thought to convert certain phyto-nutrients, called genistein and daidzin, into their active forms, genistein and daidzein. Both genistein and daidzein are powerful antioxidant and anti-inflammatory agents that have been shown in voluminous laboratory studies to work in multiple ways to support optimal health. I have a special interest in the healing power of cultured soy. I was raised in Singapore, an island nation in Southeast Asia. About 75 percent of the population of Singapore is ethnically Chinese. Therefore, growing up I had friends whose parents ran traditional Chinese medicine shops that sold cultured soy foods. Because of my Western scientific training, I had to see factual evidence to be convinced that this treatment could be of value. 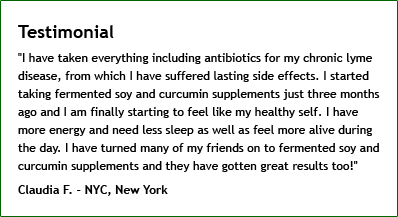 While at Columbia University, I came upon some promising research on cultured soy that showed it was extremely effective as a nutritional supplement for malnutrition, especially in people with terminal illness and chronic infections. Knowing that this information could revolutionize modern health and wellness therapy, I decided cultured soy was worthy of investigation. Adolescent and adult soy intake and risk of breast cancer in Asian-Americans. "Can Allergic Reactions to Soy be Overcome Through Fermentation?"